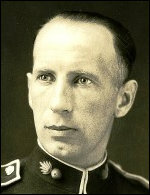 Kaye (Kysilewsky), Vladimir [Володимир Кисілевський] – scholar and civil servant; born on 4 August 1896 in Kolomyia (Ivano-Frankivsk oblast, Ukraine; at that time – Austrian crown land of Galicia); died on 30 August 1976 in Ottawa, Canada; buried in Notre Dame Cemetery, Ottawa. In 1914 Kysilewsky completed his gymnasium secondary school education in Chernivtsi. After the outbreak of the First World War he joined the Ukrainian Sich Riflemen. In 1917 he began his studies in Vienna. In 1918-1920 he served with the Ukrainian Galician Army (UGA). Briefly at the end of 1919, in Odesa, he acted as a liaison between the UGA and the British Military Mission to South Russia. After his military service he resumed his studies and in 1924 gained a doctorate in history from Vienna University. In 1925 Kysilewsky emigrated to Canada where, from 1927, he worked as a journalist. In 1926-1928 he was a member of the Winnipeg Grenadiers, a reserve militia unit. From 1928 to May 1930 he was editor of the Western News (now Ukrainian News), a Ukrainian Catholic weekly published in Edmonton, and, from August 1930 to April 1931, assistant editor of the weekly Ukraina, published in Chicago, USA. In 1930 he became a Canadian citizen. At the beginning of 1931 Kysilewsky, together with Jacob Makohin, took part in discussions with the Ukrainian Self-Reliance League of Canada (USRL, Soiuz Ukraintsiv Samostiinykiv u Kanadi) concerning the establishment of the Ukrainian Bureau in London. In May 1931 he came to London to serve as the Bureau's director. In this capacity he monitored and disseminated information on the situation of Ukrainians in Poland, the Soviet Union and other countries. He lobbied government officials and Members of Parliament and maintained contacts with journalists and academics. According to British Foreign Office documents he represented the Ukrainian National Democratic Alliance (UNDO) in the UK. From 1933 to 1936, while directing the Bureau, he studied for a PhD at the School of Slavonic and East European Studies, University of London, and prepared a dissertation on “The Ukrainian National Awakening in Austria, 1772-1848”. In November 1939 he was appointed special representative of the USRL in London with authority to speak on its behalf on matters relating to the Ukrainian independence movement. In May 1940 he closed down the Ukrainian Bureau, whose activities had been severely curtailed by the war, and returned to Canada. On his return Kysilewsky became involved in persuading most of the Ukrainian organisations in Canada to unite in the Ukrainian Canadian Committee which was formed in November 1940 (now the Ukrainian Canadian Congress). In 1942 he began to work for the Nationalities Branch of the Department of National War Services in Ottawa. At this time he changed his surname to Kaye. After the end of the Second World War until his retirement in 1962 he worked for the Citizenship Branch of the Canadian government. From 1948 to 1958 he also taught history and Slavonic studies at the University of Ottawa, becoming an associate professor and head of the Slavic Department in 1950. He was active in many scholarly societies, including the Canadian Association of Slavists, of which he became the first president in 1954. He was a Full Member of the Shevchenko Scientific Society of Canada (from February 1958), a longstanding board member of the Society (early 1960s to 1976) and head of its Ottawa branch (1961-1974). After his retirement he continued his research, particularly on the history of Ukrainians in Canada. He was the author of several monographs, including Early Ukrainian Settlement in Canada 1895-1900 (Toronto, 1964) and Dictionary of Ukrainian Canadian Biography: Pioneer Settlers of Manitoba 1891-1900 (Toronto, 1975), as well as many research reports, journal and newspaper articles and other publications. In 1974 he was awarded the Order of Canada.